Ground Floor End unit. Newly decorated and furnished in the spring of 2011, fully equipped eat in kitchen. Screened in Lanai with waterway views, what a great way to end the day, cocktail in hand sitting in the lanai watching the sun set. Do some bass fishing right outside your lanai. Eat in Kitchen has Kerurig single serve coffee maker in addition to regular coffee maker, all new appliances, ice and water in fridge door. Guest bedroom has Queen size Bed, walk in closet, 27' HD TV. Full guest bath, Den has Convertable Sofa Bed TV and desk. All new ceiling fans in bedrooms, den, living room and lanai. An 18-hole Troon Championship golf course is available on a pay-as-you-play basis. The 16,000 sq. ft. clubhouse includes a fully equipped fitness center, large pool, hot tub, and both a gourmet restaurant as well as a casual grill room/pub. A Transfer fee of $250.00 for all amenities is additional at time of arrival. Our neighborhood offers a pool, hot tub and gas grills all within a short walk from your front door. There are walking paths which wind all through the beautiful nature preserve. Keywords: This beautiful carriage house is a first floor end unit at the very desirable Colonial Country Club, one of the most sought after communities in southwest Florida. it is in a great location on a waterway, newly decorated and furnished. NEW with iron and ironing board. I Pod music dock, Netflix , Keurig coffee maker, 3 HD TV's, Additional TV in Den. Wireless printer, fax, scanner. We had a great time in Fort Myers and stayed in this beautiful condo. It was located in a very friendly gated community. The condo was very clean, comfortable and very nicely decorated in bright, cheerful colours. It felt like home as soon as we walked in. It was well stocked with everything that we needed for a 21/2 month stay. It was pet friendly so we were able to bring our small dog. We loved it. The owners were so accommodating and accessible. They were always quick to return any call and address any issue that came up. Everything went very smoothly. We also appreciated their flexibility. We have had many rental properties in the past but this condo was the best by far and we can't wait to return next year. We cannot say enough positive remarks about the owners or the condo! Everything we could ever need was there waiting for us. Super clean and super responsive owners!!! Great stay!! My husband and I (and our dog, Zoe) thoroughly enjoyed our three month stay at Colonial Country Club. The condo accommodations were great! Besides being a spacious condo, there were ample sheets, towels, kitchen supplies, even dog dishes for Zoe. As we had never rented long term before and weren't sure as to what to expect, as far as supplies were concerned, we took extra "supplies" but learned early on, they were not at all necessary. The owners thought of everything and it was obvious they wanted to make us feel very much at home, and we did! There was even a welcome note and bottle of wine for us upon our arrival. We met a number of people at the community pool which was just steps away from the condo. Everyone was always very friendly and eager to share a story or two, as were the people we met at the pool parties. Every morning we took advantage of the scenic nature/walking trails. People we met on these adventures were again friendly and Zoe even made a friend or two on these daily walks. We spent a great deal of time in the lanai--either eating meals or playing cards--it was always so relaxing and the view is beautiful. This condo is in a great location--close to restaurants, shopping, golf, even the airport. We would certainly consider revisiting, as this was definitely a vacation to remember--in a good way!!! My husband and I spent January in this beautiful property and thoroughly enjoyed the beautiful weather, the convenience of this comfy condo and all the amenities that were available to us in the Colonial CC development. David and Michelle answered all of our questions and concerns accurately and quickly, and they provided everything we needed to be more than comfortable. Their property has been well maintained and is in a great location--close to the neighborhood pool and tennis courts, wildlife preserve walking trail and back gate to the development. Though we were only renting for a month, all the neighbors were very friendly, inviting us to weekly activities around the pool and stopping us to chat when we exercised our dog. The fact that the owners allow small dogs was critical to our decision to rent this property since we wanted our aging pet to travel with us. The condo layout accommodated us very well and even allowed us to have another couple visit with us for a few days. We utilized the two gas grills available at the pool area and enjoyed eating and relaxing on the lanai with the lake view. Groceries, restaurants, public golf courses, and cinemas are all very close. Very nice bike trails are all in close proximity. We also enjoyed touring the Edison and Ford Winter Estates, our day trips to Lovers Key State Park Beach, Bonita Springs, Sanibel Island and Pine Island. The WiFi access was a nice convenience. We would recommend this property and hope to return. This month passed much too quickly! This carriage house was very pleasant for a month's stay. It was very clean, well-decorated and generously stocked with essentials. 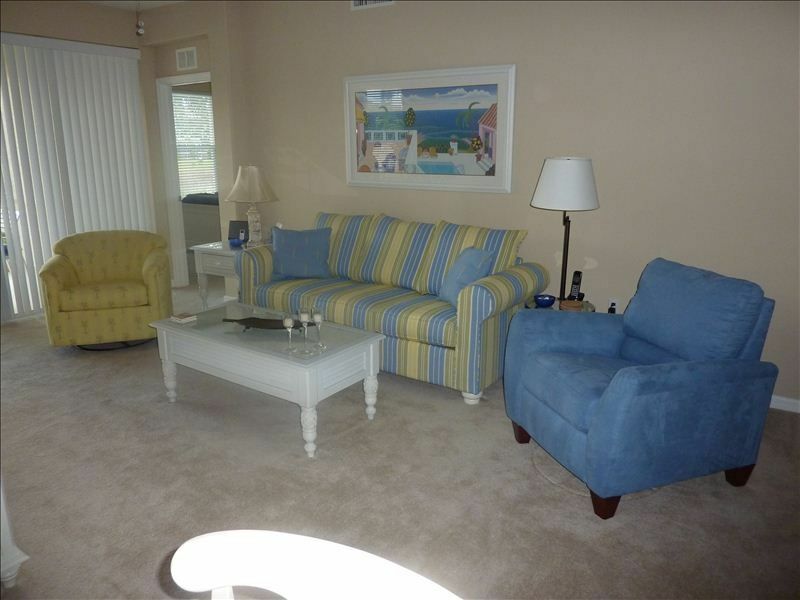 The photo accurately captures the fresh, Florida colors throughout the property. I would highly recommend this property.